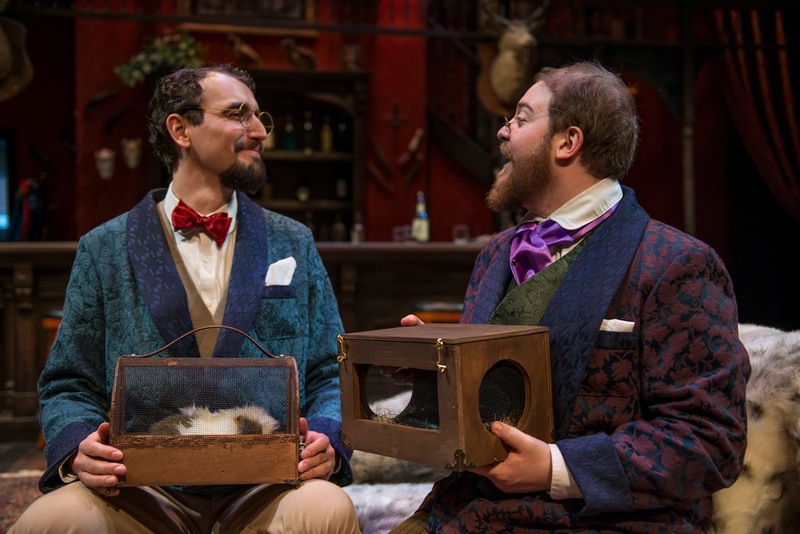 We were utterly charmed and amused by The Explorers Club and we are excited to be able to partner up with Windy City Playhouse on a flash giveaway for a pair of tickets for this Saturday's 3pm family matinee! Here at ChiIL Mama, we're huge proponents of experiential gifts, and with the long Easter weekend coming, tickets to The Explorers Club make a great present or an excellent outing with visiting relatives. Cut clutter and create some lasting memories. 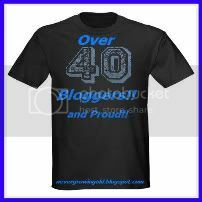 This show is recommended for ages 10 to adult and has multigenerational appeal. Disclosure: ChiIL Mama is elated to partner up with Windy City Playhouse. We have been given press comps and giveaway tickets for our readers in exchange for promoting and reviewing the show on our blog and social media outlets. No further compensation was provided and as always, all opinions are my own. I caught opening night with two 12 year old girls and a 14 year old boy and we all adored the show! This hilarious adventure is a multicultural mash-up of mistaken identities, feminist fair play, mind altering plants, and plans within plans. The physical comedy and accents are a hoot and a half and the sheer talent of this cast for madcap capers is mind boggling! 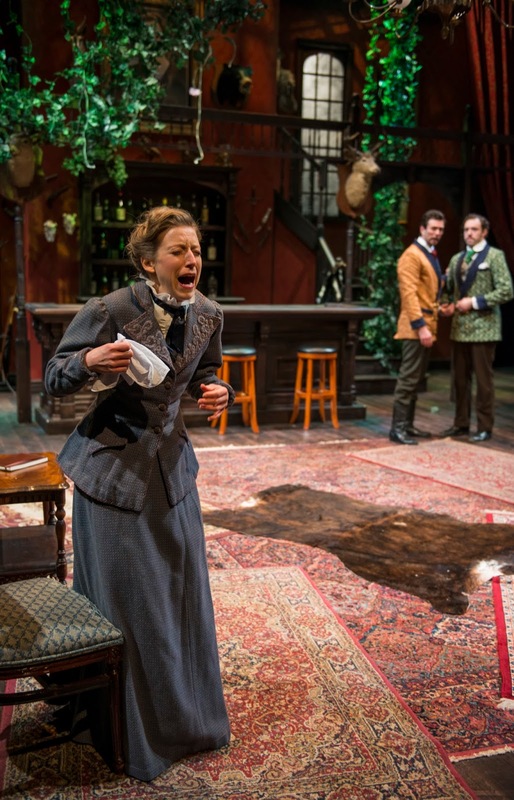 No real guinea pigs or snakes are harmed in this play. This was our first venture over to the new Windy City Playhouse and we're completely enamored with the space as well. It's got charm to spare and the first rows have amazingly comfy swivel chairs and drink tables. We love the cozy, creative lobby space. It's quite conducive to pre and post show conversations with friends. Amid a multitude of recent theatre closings, the addition of Windy City Playhouse to Chicago's store front scene is a true treasure! 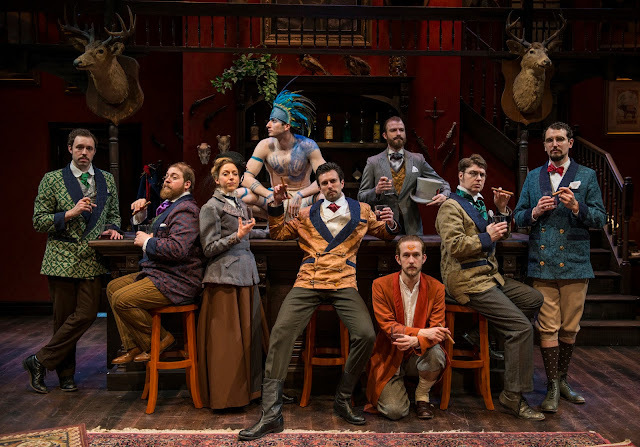 The Windy City Playhouse ambiance charmingly serves to enhance The Explorers Club as the whole theatre space becomes one big set, where the audience can enjoy drink service from the bar on stage during the 20-minute intermission, just like true characters. Their show specific custom cocktails are pretty tasty too! The run time is just shy of 2 hours and the show is appropriate for ages 10+. The antics, uproarious barbs and rejoinders of The Explorers Club are propelled by Phyllida Spotte-Hume (Cristina Panfilio) who believes Luigi, the blue NaKong tribesman she’s brought to London from a newly discovered race of Spoon worshipers, is her entree into the society as its first woman member. Goofy admirer Lucius (Alex Goodrich), a botanist and the Club’s acting president, sponsors Phyllida, while intrepid explorer Percy (Ryan Imhoff), returning from his expedition to the East Pole, vies for Phyllida’s affections even though he can’t take seriously the notion of a woman scientist. Neither can the Club’s resident zoologist (Matt Browning), herpetologist (Zack Shornick) and “archeo-theologist” (Dan Rodden). Chaos ensues in The Explorers Club after Luigi inadvertently insults the Queen, possibly setting the British Empire at war with the world. The Windy City Playhouse performance schedule is: Wednesdays and Thursdays at 7:30pm; Fridays and Saturdays at 8pm; and Sundays (consult website for Sunday times). Performances take place at Windy City Playhouse, 3014 West Irving Park Road. Single tickets range from $25-$55 and are available by calling 773-891-8985 or visiting windycityplayhouse.com. Flexible subscription packages are available for 2016. 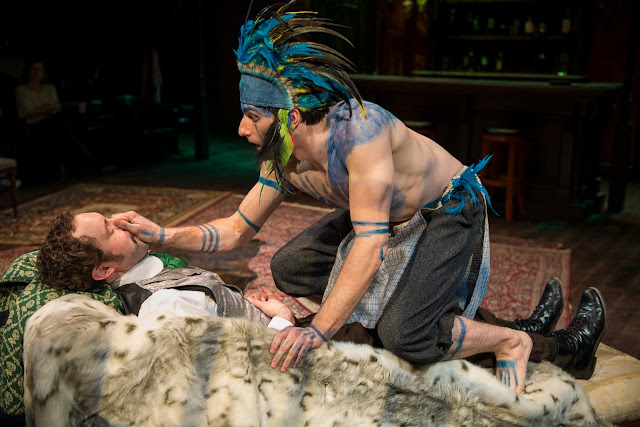 Come enjoy a special family matinee performance of Nell Benjamin’s slapstick farce The Explorers Club at Windy City Playhouse (3014 W. Irving Park Road) this Sunday at 3pm. Benjamin, Tony Award™-nominated co-composer and lyricist of Broadway’s Legally Blonde, penned this madcap physical comedy, animated by lightning-quick dialogue, daredevil stunts, precision acrobatics and onstage snakes and guinea pigs. The antics of The Explorers Club are suitable for children ages 10 and up. During the run of The Explorers Club, a range of child-friendly concoctions will be available during intermission at the onstage Clubhouse bar. As always, themed beverages are also available for adults. And post-show, families will have the opportunity to take photos with the actors in costume. 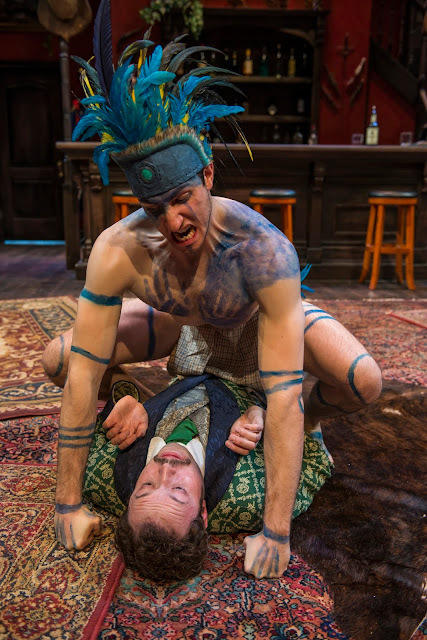 In The Explorers Club, actor, circus performer, gymnast and stilt-walker Wesley Daniel shakes things up as Luigi, a blue, Spoon-worshipping NaKong tribesman, who’s been brought to London by anthropologist Phyllida (Cristina Panfilio). Phyllida hopes Luigi will gain her entry to the society as its first woman member. 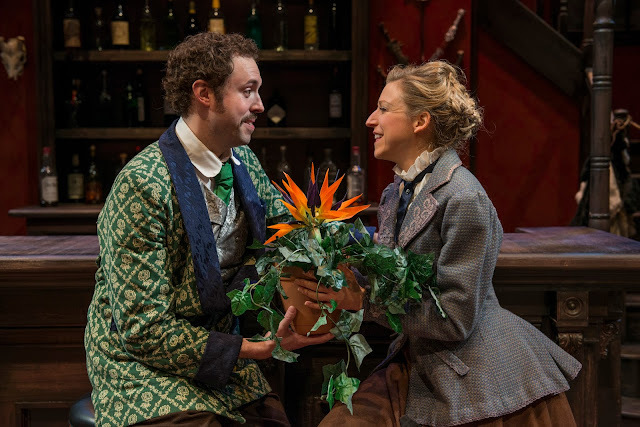 Goofy admirer Lucius (Elf’s Alex Goodrich), a botanist and the Club’s acting president, sponsors Phyllida, while intrepid explorer Percy (Ryan Imhoff), returning from his expedition to the East Pole, vies for Phyllida’s affections even though he can’t take seriously the notion of a woman scientist. Chaos ensues in The Explorers Club after Luigi inadvertently insults the Queen, possibly setting the British Empire at war with the world. Nell Benjamin, Tony Award™-nominated co-composer and lyricist of Broadway’s Legally Blonde, penned this madcap physical comedy, animated by lightning-quick dialogue, daredevil stunts, precision acrobatics and onstage snakes and guinea pigs. The prolific David H. Bell, currently developing the English-language version of La Révolution Française in Chicago, directs.